Gakken’s Play Smart GINORMOUS Workbook pairs our research-based, engaging early learning activities with our “Learning should be fun” philosophy for hours of productive and smart play time while developing thinking skills, observation abilities, focus, confidence, and a love of learning. The Play Smart GINORMOUS Workbook is packed with over 350 pages of fun-first activities including tracing, mazes, matching, sorting, puzzles, dot-to-dot and more. Your child will have hours of fun and they'll be learning and sharpening their skills without even realizing it. Each activity comes with tips for parents to help enhance the experience along with alternate ways to play each game. 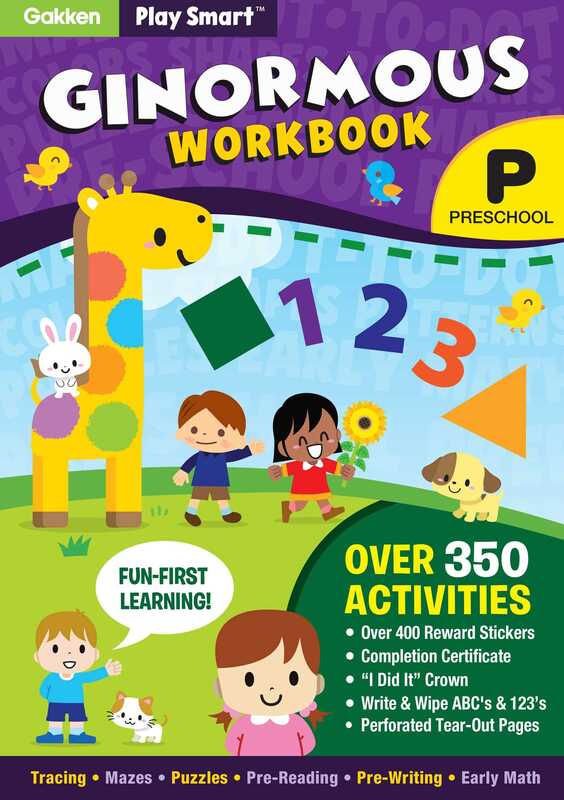 The Play Smart GINORMOUS Workbook includes 400 adorable stickers, a suitable-for-framing completion certificate and a unique "I DID IT!" crown that allow you to reward your little one for a job well-done and to encourage additional learning.